I love having a reason to celebrate beer. Not just to drink it – I don’t need an excuse for that – but to really put the buntings out and shout about what a great drink it is. I am in cheerful mood then that Cask Ale Week is nearly upon us and that I have been asked by St Austell Brewery to host a tutored tasting to kick off the proceedings in their neck of the woods. If you are a regular reader of this blog you may be aware of my previous dispatches about St Austell Brewery, including the many fine bottle conditioned ales they make and Head Brewer Roger Ryman’s experimental/limited edition brews. Guess what’s on the menu today? Cask versions of these beauties! Roger Ryman brewing up something special! The event will start with a 4% session beer, Harvest Ale, featuring hops – picked by Roger – from Ali Capper’s farm in Worcestershire. I’m sure it’ll be a tasty beer but it’s not the one that’s making my excitement levels go into overdrive. I am already doing a little dance of joy at the prospect of tasting Proper Black in cask. I’ve previously described this 6% Black IPA (don’t start!) as ‘heaven in bottle‘ so I’m full of anticipation at the cask version. Will it have the same chocolate liqueur aroma, the same dry hoppy character and chocolate truffle aftertaste with a hint of Cuban cigars? In a few hours time I will find out… but there’s a beer that’s on my mind more. Although Roger’s massively hopped Big Job IPA (which comes in at a whacking great 9% ABV – easy tigers) is also one of the beers being brought out especially for this Cask Ale Week event and I’m looking forward to comparing it with the Diamond Jubilee version which was fermented with champagne yeast – there is still another beer that is making me even more excited to the level of almost doing a little bit of wee in my pants. 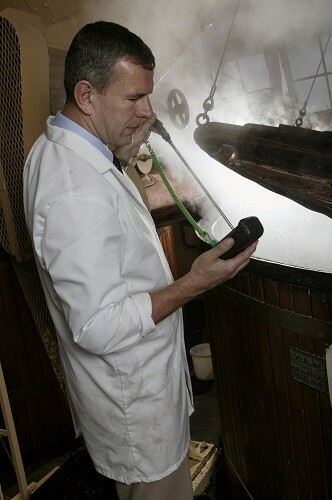 It is the re-creation of a Cornish Stout from a recipe that hasn’t been made for 100 years. Maybe it’s because I am a bit of a beer anorak, or perhaps it’s because I love a good stout (you may be aware of how much I bang on about Williams Brothers Profanity Stout for example) or perhaps it’s because I will be one of the first beer writers to get to taste it, but whatever it is I CANNOT WAIT to try this beer. I’m told it is a sweetish, full-bodied affair with aromas and flavours of toffee and black treacle – which sounds more than a little enticing. But I have to wait a little longer to find out and last night I couldn’t help feeling a bit like a kid on Christmas Eve bursting with excitement and barely able to sleep at the prospect of all the following day’s wonderful gifts. Just a couple more hours to wait….